When it comes to home remodeling, we all hope that our new kitchen will look like something out of a magazine when it’s finished. Unfortunately, most homeowners are on a tight budget and rarely get to have the kitchen of their dreams. However, the more you can do to save money on materials when you remodel a kitchen in Taunton or anywhere in the Southeastern Massachusetts region, the more you will have to spend on all those little extras that help make a house a home. From cherry stained solid maple cabinets to elegant accessories like molding and matching toe kicks, Cabinet Factory Outlet has everything you need for a top quality kitchen remodel in Swansea, MA. Stop by our showroom to see our selection of beautiful South Coast kitchen cabinets before you shop anywhere else. When you visit the Cabinet Factory Outlet, make sure to take a look at our options for cherry stained solid maple cabinets. One of our most popular models is the Quincy Cherry Kitchen Series. Also available in deep brown, espresso, and golden, this very well-crafted and constructed collection of base cabinets, wall cabinets, and specialty cabinet options makes a beautiful addition to any home at a price that you have to see to believe. Full overlay kitchen cabinets in a deep cherry stained hue feature matching molding, special-use cabinets, high-quality elements, accessories, and coordinating hardware options to help you create a truly custom kitchen on a budget. The Quincy Cherry Kitchen Series features a five-piece drawer header with solid raised panel doors, a dovetail drawer construction with full-extension and soft-closing, under mount glides. You will notice the finished sides and interiors right away, which are designed to impress and add a touch of luxury to your home. These gorgeous solid maple wood construction cabinets are available at a fraction of the price that you would expect to pay, providing homeowners the opportunity to remodel a kitchen in Taunton with all of the elements and options that they have always dreamed of for their home. When you are on a budget, it pays to have some insight into all the ways that you can save on material costs. Work with your contractor to find other ways to reduce costs by doing some of the demo work yourself or by scheduling work to be done when it is most affordable. Most contractors will work with you and even come out to the Cabinet Factory Outlet to see the types of South Coast kitchen cabinets that you want to install. Having a professional measurement will help you to avoid having to purchase additional materials to fix mistakes. A good contractor will help you every step of the way with the purchase of your cherry stained solid maple cabinets or any other materials that you require. Countertops – Choose alternate materials that have the same look and strength of granite without the price tag. Granite overlays fit directly over your existing countertop to help you save money, and other beautiful man-made materials can be used instead of heavy, costly granite with amazing results. Flooring – Shop around for flooring discounts and deals to choose styles, colors, and brands that will provide you with long-lasting great looks and durability for many years to come. High-end laminate flooring looks a lot like hardwood but is available at a fraction of the cost. It is perfect for kitchens, as it can get wet and won’t scratch after years of heavy use. Fixtures – Shop for deals that suit your style, design, color, and other needs online to save money. Get measurement information from your contractor and choose quality products from trusted brands instead of investing in high-end custom fixtures and faucets that have all the features you desire. 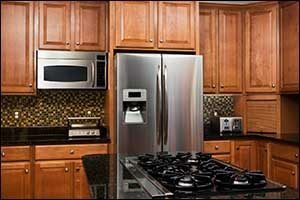 Appliances – Stainless steel “finish” appliances are much more affordable than actual stainless steel appliances, and the great thing is that most people won’t even notice the difference. Stainless steel finishes don’t leave behind the fingerprints that you have to deal with if you have an actual stainless steel appliance, yet provides the same modern and luxurious results. If you are planning to remodel a kitchen in Taunton or the surrounding area, make sure to stop by a shop for materials to use in your kitchen remodel in Swansea, MA. 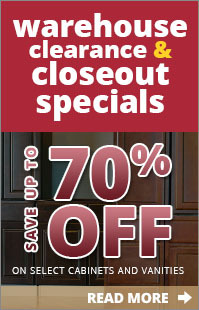 The Cabinet Factory Outlet is open to the public, which means homeowners, property owners, contractors, architects, designers, and builders can all take advantage of the fantastic discounts available on our cherry stained solid maple cabinets and other designs of South Coast kitchen cabinets in our showroom. Give us a call at 508-379-6154 or stop by our showroom Tuesday through Saturday from 9 am to 5 pm.